Are Fewer Canadians Watching NHL Hockey on TV? According to a Globe and Mail article published this weekend, “the ratings for NHL games in the first year of the broadcast contract for Rogers continue to slide,” based on information from Numeris, the company that provides all broadcast ratings in Canada. 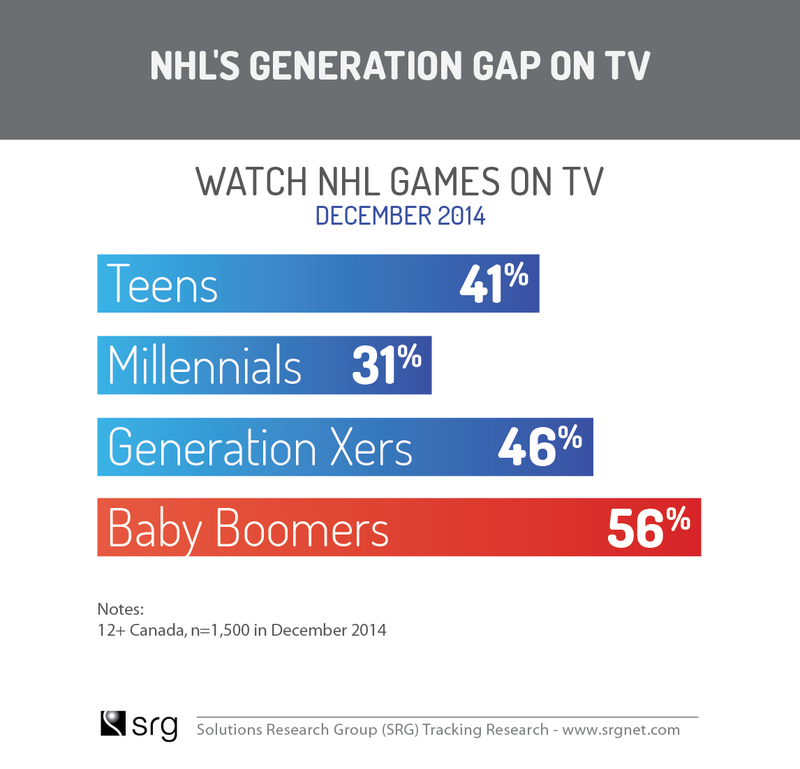 SRG’s independent tracking research conducted in December 2014 suggests a similar trend line for NHL audiences on TV. Early that month, we asked a national sample of 1,500 Canadians aged 12 or older whether they followed NHL and a number of other professional leagues – and compared these results to a benchmark we took in December 2013 among a similar sample of 1,000 Canadians. In December 2013, 56% of our national sample said they followed NHL games, teams and players in some fashion, whether on TV, on social media, online or mobile. In 2014, the same question yielded a 53% response, representing a 3-point drop in one year. As a general rule of thumb, we would think of a 3-point drop as just at the edge of the margin for error, or as a potential short-term fluctuation. However, when we looked at the numbers closely by different media, we noticed that, in fact, the percentage of Canadians who said they followed NHL specifically on TV has declined from 50% to 44% between December 2013 and 2014. This would seem to be directionally in line with Numeris ratings, which show a significant year-over-year slippage for NHL hockey ratings. But it’s not all bad news according to SRG research. Between December 2013 and 2014, the number of Canadians who said they followed NHL games, stars or teams on at least one digital, social or mobile platform actually increased from 23% to 26%. So what we are seeing is an increase in interest in following NHL hockey – games, players, teams – on digital and social platforms and a decline on TV. The problem lies in the fact that the TV drop is bigger than the digital increase. We see a similar story for the CFL. It is well documented that the league recorded much lower ratings in the 2014 season vs. 2013, according to Numeris. Our research is directionally in line with Numeris data here as well: In 2014, 25% said they followed CFL on TV, compared to 30% in 2013, a 5-point drop. And yet, CFL gained on digital, albeit very slightly: 13% in 2014, compared to 12% in 2013. When we look at the data generationally, we see that the biggest issue pro sports leagues like the NHL will face is to keep the Millennials engaged with the TV product. We are seeing a bigger slippage in that generation’s engagement with pro sports on TV, with some exceptions. In the case of NHL hockey, the generation gap is acute. 46% of Canadian Millennials say they follow the NHL (on any medium), compared to 58% of Baby Boomers, a gap of 12 points. That 12-point overall gap between generations more than doubles to 25 points when we look at taking in the games on TV, where only 31% of Millennials say they follow NHL on TV, compared to 56% of Boomers. Remarkably, more Canadian Millennials now follow NHL games, teams or stars on digital, mobile and social channels (33%) vs. TV (31%). However, there isn’t really that much full-game content online, so this points to a profound change in sports viewer culture for that generation where short snippets, Vines and updates on social media are essentially becoming substitutes in some cases for the actual game on TV. It is as if the Millennials are saying, “why watch the whole game on TV or even bother to find where it is, when you can follow along on social media with fan-generated snippets of the big plays popping up seconds after they happen?” This change in culture was likely the driving force behind National Football League’s recent decision to launch an active YouTube channel which will generate clips and quick consumable and shareable content by the fans. Another influencing factor to watch is the lower uptake of paid TV in Millennial households – especially those households without kids. These households are twice as likely to be Internet-only and without paid TV service compared to the national average. Let’s not forget that there are 2.5 million households without paid TV in Canada currently. Our early Canada/U.S. comparative research also suggests that newly-formed Canadian millennial households are slightly more likely to forego paid TV service compared to their counterparts in the U.S., which suggests that trends in sports viewing will likely diverge from our neighbors to the south on that front. Everybody loves a big TV spectacle like the Super Bowl or a gold medal hockey game – they are unique, big-draw events on TV in this fragmented media world. But when it comes to day-to-day sports, perhaps watching live games on TV isn’t quite as important to Canadians anymore as the prevailing wisdom dictates.